That’s all for 2011! Less shows, more productions in 2012! The Band recorded round about 100 hours of Live and Tour Footage for a Live DVD Release … keep an eye on it! Join NEP YouTube Channel to watch the 2011 Violent Playground Live Video. Have a good New Year! Take Care! 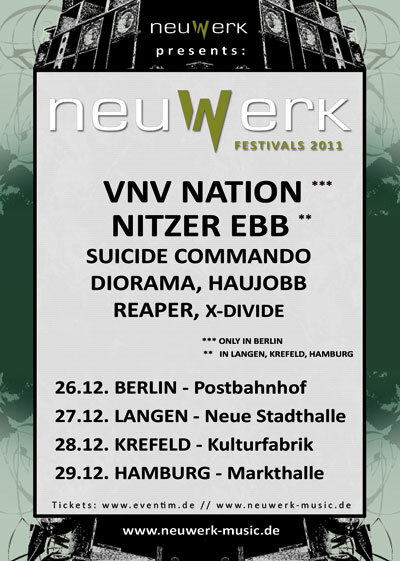 Neuwerk Festivals 2011 – get your tickets now! Get the latest News from Neuwerk Desk: Tickets are still available through http://www.eventim.de. You can also purchase your ticket at the neuwerk Shop http://www.neuwerk-music.de. These tickets are available until 03.00 p.m. of the day of each show and you can simply print them at home. Neuwerk will also be able to offer tickets at the box office for all 4 shows. Festival Schedule and Running Order available at neuwerk website as well! 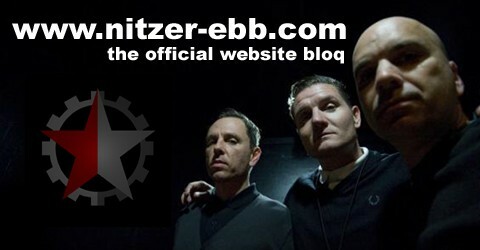 Join the final Nitzer Ebb Live Shows in 2011 at the Neuwerk Festivals in Germany! Three older classic Ebb tracks are additional on the setlist to play exclusively on these shows! The tracks are never played live since the Reunion Tour in 2006! Surprise, Surprise the tracks are: Into The Large Air, One Mans Burden and Violent Playground. Don’t wait – the tickets are limited. You can purchase the tickets either through: www.eventim.de or through the Neuwerk Shop, where you can save some of the surcharges you usually have to pay.